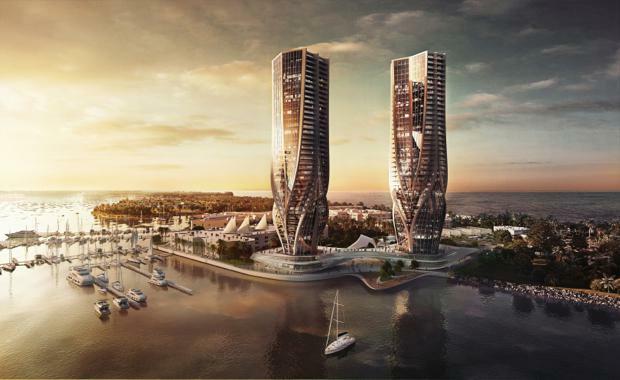 Property developer Sunland Group has lodged a Development Application with Gold Coast City Council for its proposed redevelopment of Mariner's Cove, unveiling plans for a world class residential and cultural precinct with an estimated end value of $600 million. Sunland Group acquired the Mariner's Cove site, located adjacent to Marina Mirage on Sea World Drive, in 2013 for $13 million. The site has direct frontage to the Broadwater, with views to the Broadwater Parklands and beyond. Designed in collaboration with internationally acclaimed architect and Pritker Prize winner Dame Zaha Hadid, Sunland's proposal comprises two sculptural residential towers of 44-storeys, comprising 370 apartments and a boutique hotel of 69 suites. The iconographic proposal includes the city's first privately-owned cultural precinct dedicated to the arts through an art gallery, museum and outdoor sculptural gardens. It will also feature 1,950sqm of ground floor retail and dining, and an underground aquarium. Sunland Executive Chairman, Dr Soheil Abedian, said the proposal represents a true mixed-use development, where leading architecture and residential spaces are combined with unique, world-class tourism and cultural amenity. "Mariner's Cove is an exceptional site worthy of monumental architecture," Mr Abedian said. "This proposal has the capacity to enable the Gold Coast to further define its cultural identity, not only through defining architecture, but also through the enhancement of cultural aspects it will provide to the city. "Sunland Managing Director Sahba Abedian said the design is a work of art on an architectural scale. [urbanRelatedPost][/urbanRelatedPost]"Each residential tower is designed as if it were an organic, living form, with sinuous lines interlacing upwards from the tapered base, creating a sense of flow and movement. This vibrancy is further brought to life by the reflection and interaction of the glass facade with its stunning Broadwater setting. "At the ground plane, the towers merge seamlessly with public spaces dedicated to culture and the arts via an art gallery and museum, an outdoor sculptural art precinct, and conference centre. "The museum's sweeping organic forms reflect the landscape of its unique location, symbolic of the dunal shapes distinctive to the Broadwater. "The entire ground level has been designed as a continuous public amenity, with a plaza and waterfront promenade connecting retail and dining spaces, boardwalk gardens and pedestrian links. "The underground Aquarium, organically integrated in the landscape and plaza layout, completes the master plan."